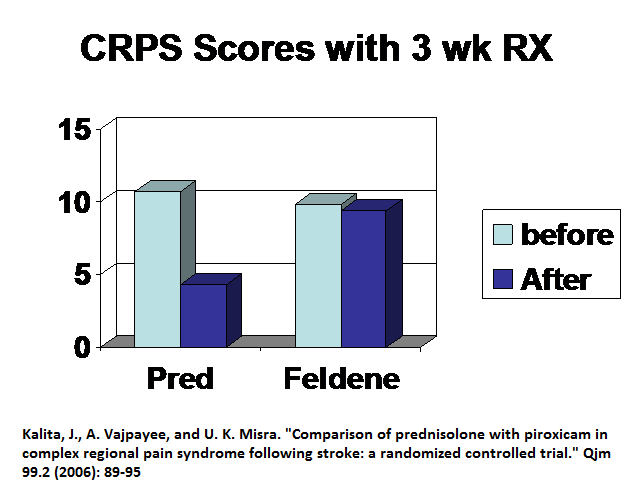 The most successful treatment for CRPS especially early is Prednisone. It is even used in wrist fracture situation. Yet this fact seems not all that well known as is the fact one should continue the course for 8 weeks. Needless suffering though ignorance. Early treatment of acute complex regional pain syndrome after fracture or injury with prednisone: why is there a failure to treat? A case series. Pain Research and Management 2016 (2016). Moseley, G. Lorimer, et al. “Intense pain soon after wrist fracture strongly predicts who will develop complex regional pain syndrome: prospective cohort study.” The Journal of Pain 15.1 (2014): 16-23. Annals of Neurology, vol. 36, no. 5, pp. 728–733, 1994. Long-term functional outcome measures in corticosteroid-treated complex regional pain syndrome. Europa medicophysica 42.2 (2006): 103-111. Pain Physician, vol. 17, no. 2, pp. 179–185, 2014. I contend with higher doses this could be lower. Ann Rheum Dis. 2014 Jan;73(1):243-6. Efficacy of oral prednisolone in active ankylosing spondylitis: results of adouble-blind, randomised, placebo-controlled short-term trial. 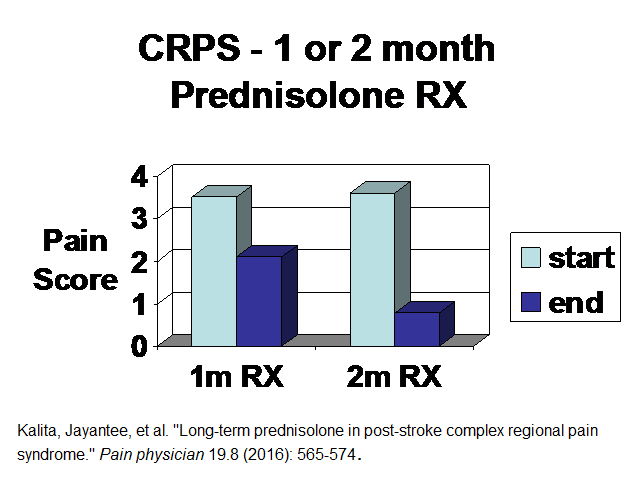 Long-term prednisolone in post-stroke complex regional pain syndrome. Pain physician 19.8 (2016): 565-574. 50 mg od prednisone for 2 weeks ( I routinely give alprazolam PRN sedative as some become quite activated with agitation and insomnia). Tapered down from 50 mg to off over remaining 6 weeks – near the end she had minimal pain. How does it work in longstanding CRPS – there was a stupid study done that did not about results of above study as it was not out yet. Pain Medicine 17.2 (2015): 337-343. Results – much as would be expected from study above found this one found – under two months treatment gains you suboptimal results and very little was found in their study. Can’t conclude much from it yet I am sure it will now become standard gospel that treating long term CRPS with steroids is ineffective. What a disappointment. Comment – I would contend that after 3 months local issues become important and peri-neural njection to skin, Intramuscular stimulation to muscles, Botulinium to any dystonia, and steroid injections to radio-ulnar and radiohumeral joints will be important but I will write separately about those things. In longstanding cases, I would still use my protocol of prednisone but not expect results in first 2 weeks. With 2 months of Prednisone one must be willing to accept the rare risk of osteonecrosis of hip where hip collapses and one needs a hip replacement…. This entry was posted in complex regional pain. Bookmark the permalink.